Directions: Click your mouse over each question to see the answers to common estate sale questions. Do I have enough items to hold an estate sale? Typically if you are looking to liquidate an entire household you will have enough items to warrant a full 2 day estate sale. Average household being a minimum of 2 bedrooms, living area, kitchen etc. However despite the size of the house, we usually recommend that there be at least $4,000 worth of sellable items. These items should be a good mix of everyday household items (small appliances, electronics, cleaning supplies, books, clothes, etc. ), furniture, tools or yard items, decorator items (mirrors, candlesticks, artwork), table and bed linens, kitchenware, collector items or antiques. Why should we hire an Atlanta estate sale company versus doing it ourselves? Running a successful estate sale can quickly turn into a full-time job. For most families it is hard to juggle and find the necessary time to devote to the project. Pricing, organizing, research, set-up, marketing the event, working the event(and finding enough volunteers to help), bartering with buyers, and final clean up is not only time consuming but can also be mentally exhausting for family members trying to stage their own sale. How do you know which items are worth what? How will you guarantee a good turn out to your sale? What happens when your 2-3 week project has suddenly turned into months? By hiring Lott’s Treasures, it’s as easy as handing over the key and letting us do the work. We have estate appraisers and experts who know how to price accordingly and research items quickly. We have an extensive list of buyers and dealers and our extensive advertising and marketing insures a good crowd. We take the stress off you and turn what would have been a few months long project into 2-3 weeks tops. Factor in how much your time (and sanity) is worth to you and we think you’ll find that our commission rate is well worth the service! Should we clean up the house or dispose of items prior to bringing in an estate sale company? NO! Please whatever you do try and leave the premises “as-is”. We appreciate the fact that many times families want to clean or de-clutter the house before bringing us in , however we have found that many times items that families threw out or donated ahead of time were items that could have been sold in the estate sale. Please leave everything as is. It’s our job/service to go through and determine which items are sellable. We’ve sold, hauled off or cleared the home of all the “small” stuff, would you still be interested in selling the furniture only? Unfortunately many times we have been called in after the families have de-cluttered the home of all the small stuff, thinking they were making our jobs easier, however, in cases like this we usually have not been left with enough items to be able to hold an estate sale. A successful estate sale needs to be a good mix of small and large items. A good majority of the sale comes from small items such as household cleaners, books, tools, linens, clothes, décor items, etc. In order for us to market a sale we have to take lots of pictures, our buyers want to see that there are lots of items for them to pick through. Rule of thumb is the more items you have in the sale the better. What items sell well at an Estate sale? Do we need to have lots of antiques? Lawn mowers, leaf blowers, yard equipment etc. And don’t worry if you do have antiques or collectibles, we always have that market for those items as well! Are there any items that traditionally don’t do well at a sale? Pianos & Organs – unless it is a Steinway. Pianos and organs can be very hard to find a new home for. Sometimes they sell , sometimes they don’t. Older Furniture-if furniture is outdated (and not considered antique or vintage) it can sometimes be hard to sell. If it is stained, ripped or has pet or smoke odors it can also be hard to sell. Older electronics – cabinet TV’s and stereos, some are considered collectible and vintage, others are just considered outdated. Items that are chipped, cracked or damaged. Regardless, if you have any of these items in your estate we ask that you leave them in place until we have had the opportunity to assess them. What if you find personal items (money, paperwork, photographs etc) while preparing the house for the sale? Actually this is quite common. Even in cases where the family has thoroughly gone through the house, by the time we clean out every drawer, closet cabinet, etc. it is inevitable that we will find something. No worries though, we box all of these items up for you and either make arrangements for you to pick them up or ship them to you if you are out of area. 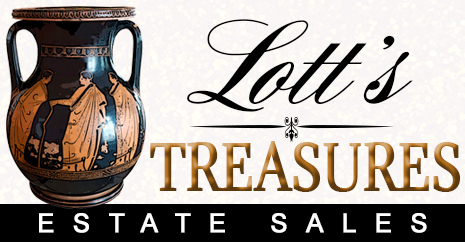 Is Lott’s Treasures licensed and insured? Yes, we are a licensed and insured business. How much does the average estate sale make? Because each house is different this is a hard question to answer. Please be assured that it is in our best interest for you to have a successful sale! How successful is the average estate sale? 99% of the time we are able to sell 80% of the estates sellable items. The choice is yours of what to do with your remaining items. This will be defined in the contract. Do you clean the house after the sale? No. Our job is to liquidate the house of its assets. We can recommend cleaning services at your request. For any large/excessive trash removal we can call to get an estimate for an outside service. When is the best time to hold an estate sale? Whenever your need arises…but every weekend is good for us with the exception of certain holidays that fall on a weekend. If you have a situation that is urgent please call us and lets see what we can do to help you! How is Lott’s Treasures paid / what is your fee? We are paid on commission only. It is in our best interest to insure you have a successful sale! Our rate varies between 30-35%. At the end of the sale our commission is deducted from the proceeds of the sale. No upfront fees, no minimum guarantees. The commission rate is based on the scope of the project as well as the final sale amount. Most estates will fall in the 30% range (unless there is an extreme amount of clean-up, haul off or other unique circumstances).